Sugata: Shinogi-zukuri. very shallow tori-zori, iori-mune. Nagasa: 15.94 inches (405 mm) long. Nakago: Ubu, 5.24 inches (133 mm), one mekugi-ana, kiri yasurime, kurijiri nakago-jiri. Kissaki: Chu-kissaki 0.98 inches (25 mm), ko-maru boshi with what may be a bot of kaeri. Moto-haba: 0.93 inches (23.5 mm). Moto-gasane: 0.24 inches (6 mm). Saki-haba: 0.67 inches (17 mm). Saki-gasane: 0.16 inches (4 mm). Hamon: Chu-suguha with ko-nie, sunagashi, and what looks like the start of ko-ashi. 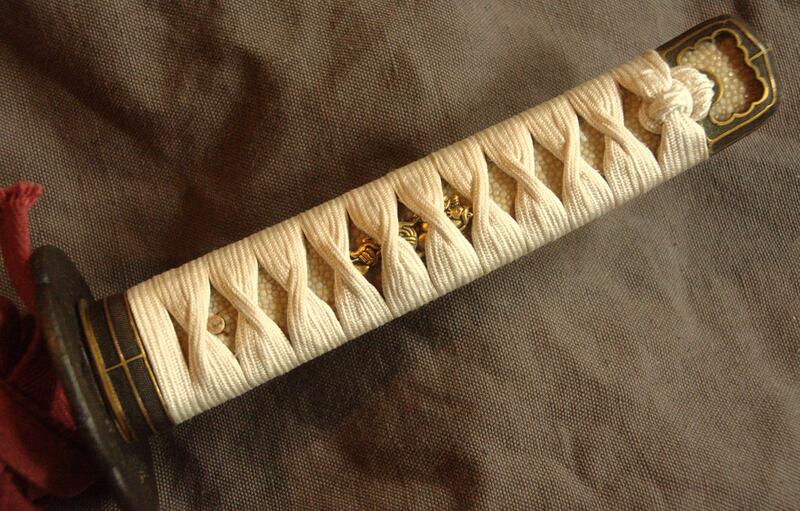 Hada: A very fine, tightly knit, ko-mokume. There appears to be ji-nie in the hada. Blade condition: In good polish. One very small potential blister by the habaki. 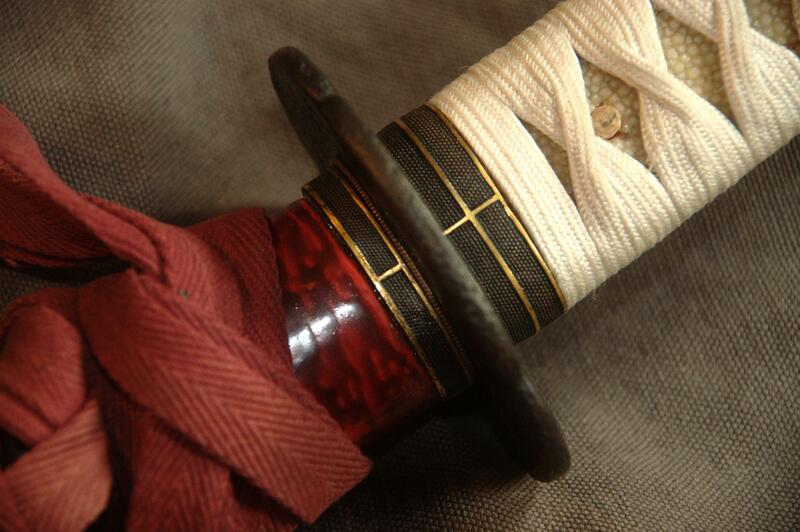 Nice handachi mounts, iron tsuba, shrimp design for kozuka, red saya. 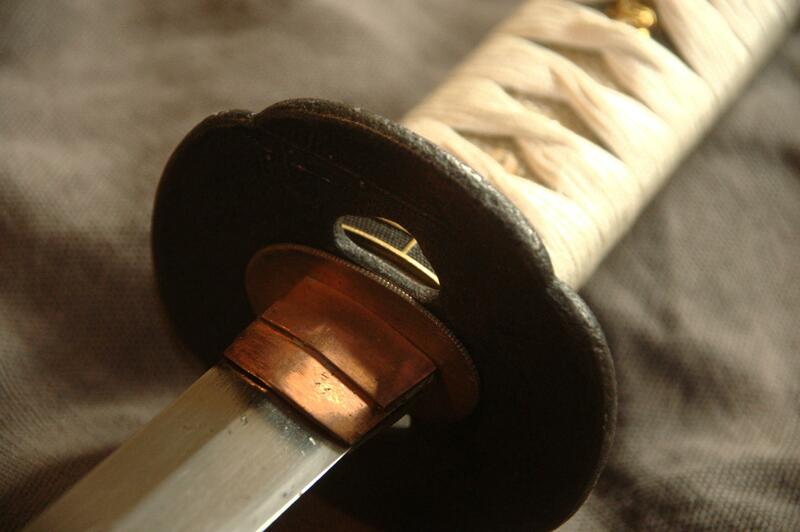 A very nice wakizashi. Quite possibly Bungo Takeda; rather reminiscent of Fujiwara Yukinaga's work (active 1624-47).